video now is easy to shoot and post online. YouTube is the third most visited site on the Internet, behind only Google and Facebook. Links to your website from YouTube and other video sites raise your visibility and search profile and help create links back to your site. As with any online content, you can hire out video production to professionals or do it yourself. The main difference between outsourcing video content and written online content is the variation in pricing. Video services have a much wider price range. Big companies pay thousands of dollars per day for video production crews, and thousands more for editing and post-production work. Small businesses typically don’t have big budgets for video, but that’s not a problem. If you want video only for online use, you should be able to find a number of companies that specialize in creating online video content at affordable rates. The technical requirements for online video are much less demanding than for broadcast. I have found several companies that will shoot on location or in their studios and deliver several web-ready videos for less than $1,000. To appreciate the value of that price, compare it to the cost of traditional advertising. Beware: start-up video companies come and go. If you anticipate on-going needs for video pick an established company. If price is paramount make the best choice you can and get the job done. Done beats perfect. The best way to find a video company that meets your needs and fits your budget is to ask other business owners who are using online video. Get samples and references. When you review samples consider these two critical areas: sound and lighting. Any company you hire should have wireless microphones. You get better sound by having the mic attached to the person talking instead of relying on a small mic built into the camera. Better consumer grade cameras accept wireless microphones, as do all professional grade cameras. Good lighting gives your video a professional look. You don’t want shadows or glaring “hot spots” that will make your video hard to look at. Not all video shoots require more than available room or outdoor light, but no qualified professional would shoot without it when called for. green screen video for you. You see this technique used all the time on television weather reports. The video crew simply shoots with a solid green background, and then substitutes any image you want in place of the green. Sometimes other colors are used, but green is most common. Be certain not to wear clothing the same color as the background, or that item will disappear from the picture. Now for the good news: it’s really easy to shoot good quality video to post on YouTube and put on your website. I have seen impressive videos shot using smart phones, but you have to have a steady hand and good light to do that. Most digital still cameras also shoot video, but sound quality may not be as good as you need. 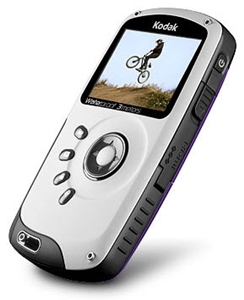 One of the simplest ways for non-professionals to shoot online video content is with a camera such as the Kodak Playsport. For less than $150 you can get started producing your own online video content. The Playsport fits easily into pocket or purse, so you can shoot anytime, anywhere. It’s water-proof to 10 feet, so it’s great for the beach or poolside, too. The camera comes with built in editing software and a USB connection. To trim out scenes you don’t want, simply plug it into a computer and it will lead you through the editing and uploading processes. People prefer online videos that inform or entertain. So, inform people. If you have a talent for humor, give them a chuckle, but don’t overdo it. Customer testimonials make a great place to start. When people say good things about you on video the positive impact is multiplied by tone of voice and facial expressions, cues that never get delivered by print alone. Short how-to videos can help build your reputation as an expert in your field. Product demonstration videos can visibly show the features, advantages and benefits of your product. The video content in this online press release provides a good example. A company employee did the narration while he operated the camera (and an associate stood by with a fire extinguisher!). Screen capture software allows you to make a video of anything you can view on your computer screen and record a voice track to explain it. It’s a great way to make videos that teach, sell or train. The possibilities are limitless, including turning PowerPoint presentations and slide shows into videos. Camtasia Studio, the gold standard for screen capture video software, offers a rich feature set and the price reflects it. It takes awhile to master the full set of Camtasia features, but you don’t have to use all of them to get professional quality videos. And TechSmith, the developer, provides excellent training with…Catasia videos. If you don’t need a full-featured product, Easy Screen Capture Video may do everything you need. It costs only a few dollars. Less is more – keep videos in the 30-seconds to 3-minute time range. If they go longer people stop watching. Plan before you shoot – consider the topic, and how it can be broken down into several short segments. A series of videos will keep people coming back to your site. You can shoot several at once, then edit to break them down into separate videos. Optimize – do keyword research, then optimize videos with descriptions that include keywords and tags so others can find them. Video content doesn’t have to be shot with a camera – Screen capture videos are great for providing instructions. A series of photos or charts with narration also can make an informative video. To learn more about creating written online content, please visit our Website Content page. To see how to get video and text pages published widely on the Internet go to our Press Release Distribution. The Reputation Management page discusses activities following distribution.